Today is my birthday. So, due to my obsession with burritos for the last 5 months (the last 5 months in particular, anyway – we all know that I’ve been obsessed for more than just that amount of time! ), my mum and Emma, one of my sisters, decided to make a burrito-themed dessert for me. This was actually the most original dessert that I’ve ever had, and it was beautiful! It looked just like a burrito on my plate, and had a dessert filling to replace every ingredient that would be in a normal burrito. It suffices to say that I was (and still am) more than a little impressed with this dessert. 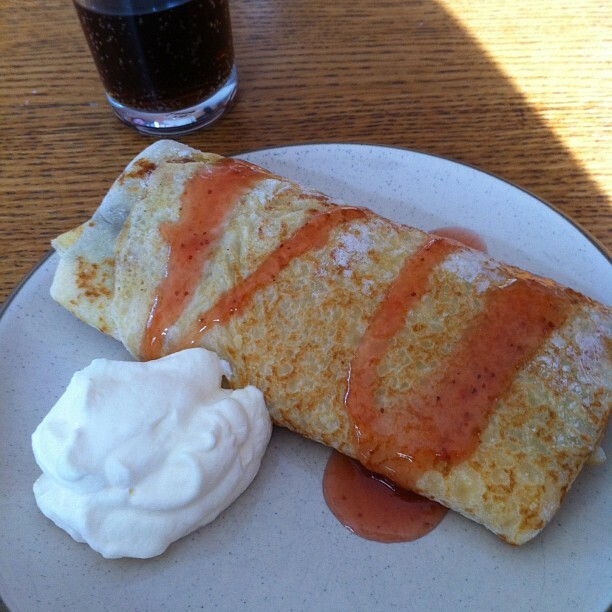 So, here’s what they did: They took pancakes to use as the tortilla wraps, and used melted chocolate instead of beans. In place of rice there was vanilla ice-cream and brownies were used in the place of meat. Instead of guacamole, they used mint chocolate-chip ice-cream, and some crushed cookies were used in the place of crushed tortilla chips. Jam was drizzled over the top like salsa, and I had some cream on the side, as a sour-cream equivalent. The dessert burritos were then frozen some more. Like I said, these were delicious. 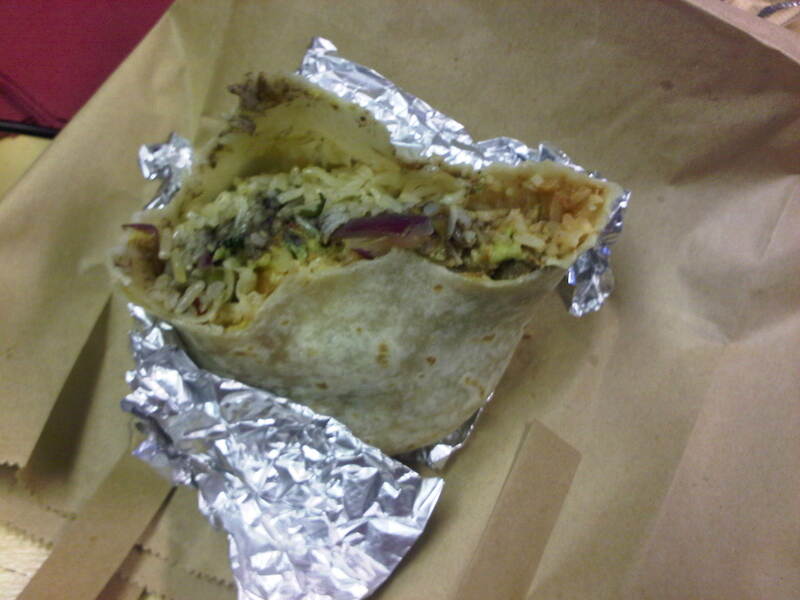 Obviously, I can’t rate them – it wouldn’t be fair to every other burrito that I’ve had; nobody could compete with this. Probably the most original burrito that I’ve ever had, that’s for sure! Hard to believe that this all started as a joke about how to make a dessert burrito, at the dinner table about 2 weeks ago, and Emma took notes and actually went and made them. I’m very impressed! If every burrito bar in Dublin were to begin serving dessert burritos to go after their meals, I’d be a happy (and much, much fatter) man! A while back, after my first review of Café Azteca, the owner got in touch with me on Facebook – I was really impressed at how quickly he figured out who I am. He had an idea, which he proposed to me: I’d tell him what’s in my ideal burrito, and he’d make it. If I liked it, he’d put it on the menu. So the day came, today, when my burrito was ready to try. I’ve been looking forward to this for a while – and the fact that it came the day before my exams begin is a good sign for me, right? Café Azteca have decided to call this burrito Simon, Simonazo, in my honour (my name is Simon for anybody who doesn’t know). The phrase Simon, Simonazo has a meaning in the Spanish language, as well, so the owner was telling me. ‘Si’ means yes, in Spanish, and ‘Simon, Simonazo’ means a very positive ‘yes, of course, absolutely’. The ‘-azo’ part of the word ‘Simonazo’ also means to hit – ‘Simonazo’ means to hit Simon, from my understanding. He wasn’t being violent here, he was describing the burrito as something that stands out, that will strike you as being different. I quite like it! Aside from having a good discussion on Mexican food culture with the owner of Café Azteca, I ate my burrito too. 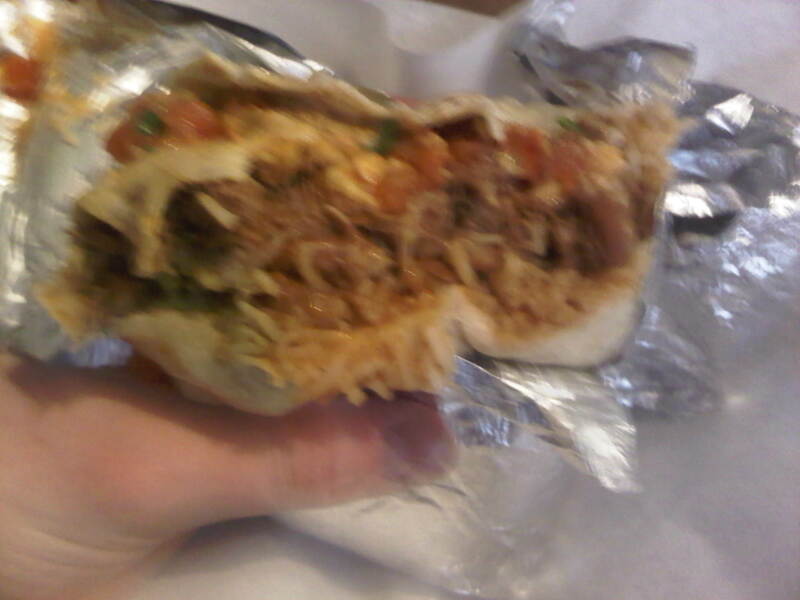 My burrito consisted of thin pieces of beef steak, guacamole, Swiss cheese, pico de gallo, rice and refried beans. I came up with my own salsa to go with this burrito, as well – Azteca took their Omacatl Salsa and added pineapple and mango to it (among other ingredients). The owner added a few of his own touches to the salsa, too – there is fresh orange juice in it, plenty of garlic, some lime juice and some authentic Mexican ingredients which I can’t pronounce, let alone spell! There were eight habanero chillis in a batch of this salsa – I asked for something spicy and Azteca certainly delivered! Omacatl is a deity in Mexican culture – he is the god of feasts and celebrations. It is said that anybody who dishonours Omacatl by not enjoying themselves during a celebration will be cursed. An apt name for a salsa, I think – if you don’t enjoy it, it becomes a curse. So Café Azteca challenged me to come up with my perfect burrito, and helped me along the way with that, and those of you who are adding up the scores with see that this was as close to perfect as any burrito that I’ve had has come. A ridiculously high score of 48/50 – I genuinely don’t think that any burrito will beat this. I have a feeling that I’ve found Dublin’s best burrito, and that I have the honour of having it named after me! It’s Wednesday. And, since September (except over the holidays), that meant that it was Tiny Donkeys day. But when the college term ended, so too did the Tiny Donkeys. So now Wednesdays are a day where burrito tradition falls apart. And that’s true, unless you’ve got Aidan to motivate you. Aidan decided that burrito Wednesdays would continue, at least during the study period, even if the Tiny Donkeys does not. And so, for dinner today, I ventured out of the quiet and air-conditioned ‘tranquillity’ of the Mechanical Engineering Department computer rooms with S-Dawg to meet Aidan and head off to the hustle and bustle of Tolteca, for our dinner. And as it turns out, I’m very glad that I did this. 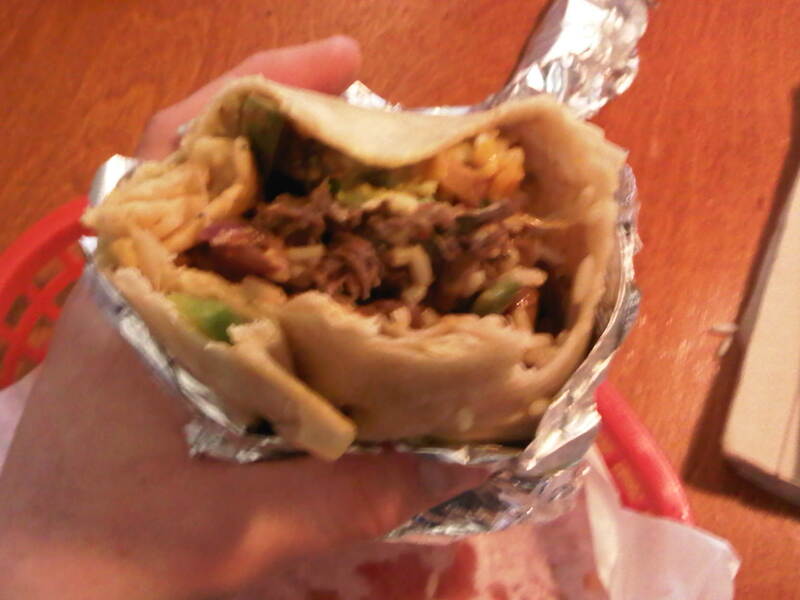 I mean, more glad than I am any other time that I get a burrito, because, let’s face it, burritos are freakin’ awesome! I’m particularly glad this time, that I went for a burrito. Not that I ever considered saying no – as soon as Aidan mentioned it, I was raring to go. The reason that I’m so glad that I went to get a burrito today is simple: I had the single largest burrito that I’ve ever eaten. 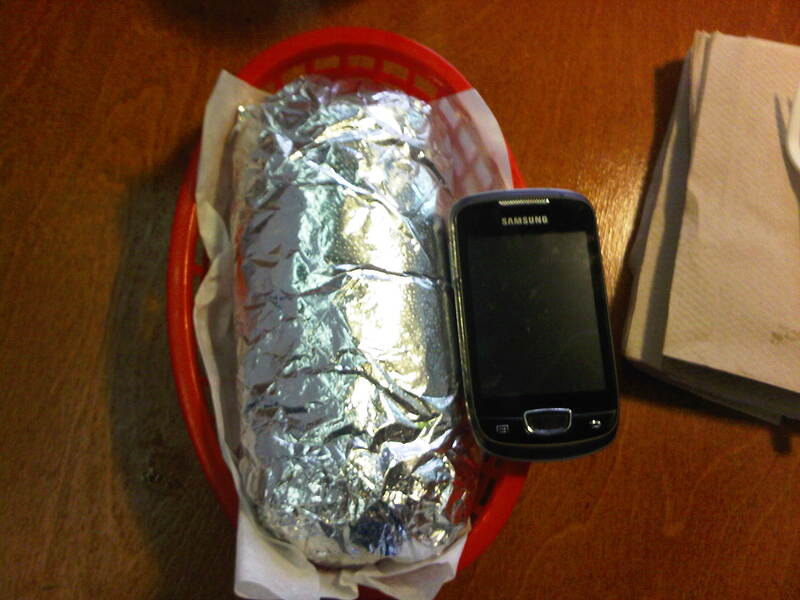 I’m not even exaggerating when I say that it was easily twice the size of a normal burrito from Tolteca – have a look at the photo. It was so big that it took two members of staff to wrap it. It was so big that the first tortilla broke and the staff had to add a second one around it. 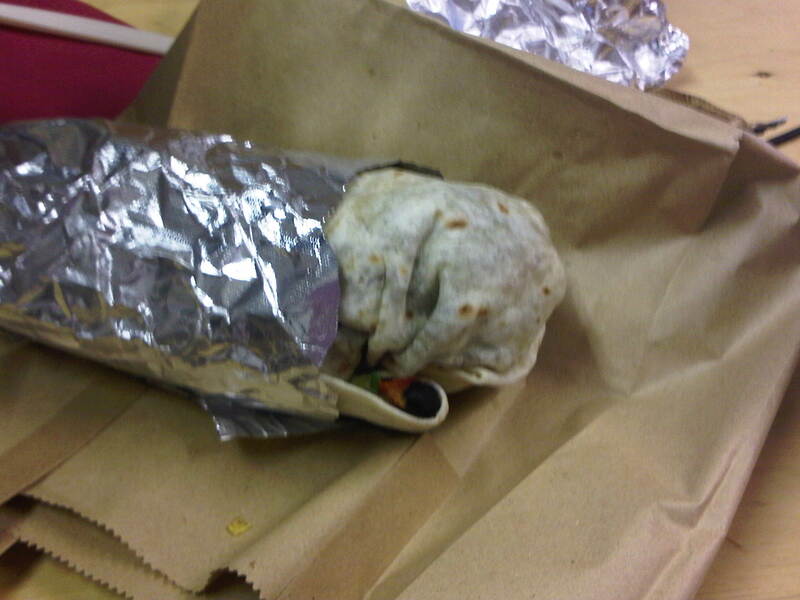 My burrito was as heavy as a newborn child. I suppose that I should explain why my burrito was so big: I got almost everything that I possibly could in my burrito. And when the staff were adding the meat, there was a (very) large chunk that was all stuck together, so that was just added as it was. Between that and the extras that I asked for, this burrito had about the same diameter as my upper leg. I’m borderline in a food coma, sitting on my bed drinking a cup of tea now. I kind of hate myself, just for how much food I ate, but I’d be sickened with myself if I couldn’t finish it. I think it was a lose-lose situation for my self-respect! That said, Tolteca have done well out of it, scoring a whopper 41/50, which is the highest score that they have ever managed (and only 4 points off the top spot in Dublin). They are now tied, in fact, for the 5th best burrito that I’ve had in my quest for Dublin’s finest – not something to be ashamed of at all! Now I think that I’ll lie down, watch some crappy TV and wait for the food coma to kick in. I’ll try to have another burrito before next Wednesday, but we’ll see how the study goes. My first study week is finished, and I’m on to the second one. It still doesn’t feel like the exams should be starting soon, but the improving weather will fix that… So, since exams are coming, I’ve been studying, and avoiding study when I can. During one of my intense procrastination sessions, I found something that caught my attention as being ridiculously cool – as a fan of burritos and as an engineer. On this (http://design-milk.com/burritobot-the-tortilla-filling-3d-printer/) website, there is a 3D burrito printer, which is seriously unusual – rapid burrito prototyping. I really want to see a video of this in action! I’ve also got something to look forward to after the exams, and that’s starting to feel real – I’m flying out to San Francisco at the end of May, and won’t be back until September. But fear not, California is the home of the burrito bar, so I’ll have to try and find the best burrito that San Fran has to offer, while I’m away. Yesterday, Monday, some of the people from work organised another games night – Game of Thrones once again, which I maintain is the best board game on the planet. While I may not have won, there’s nothing wrong with coming third; thanks mostly to another player who knew that he had no chance of winning, and so he retreated, in the hopes of leading me to victory. Since games night came after a long day of studying, I decided that a pre-game burrito was in order. I’d been feeling like taking a trip to Café Azteca once again – it’s been a while since I’ve been, and I’ve only been the one time. 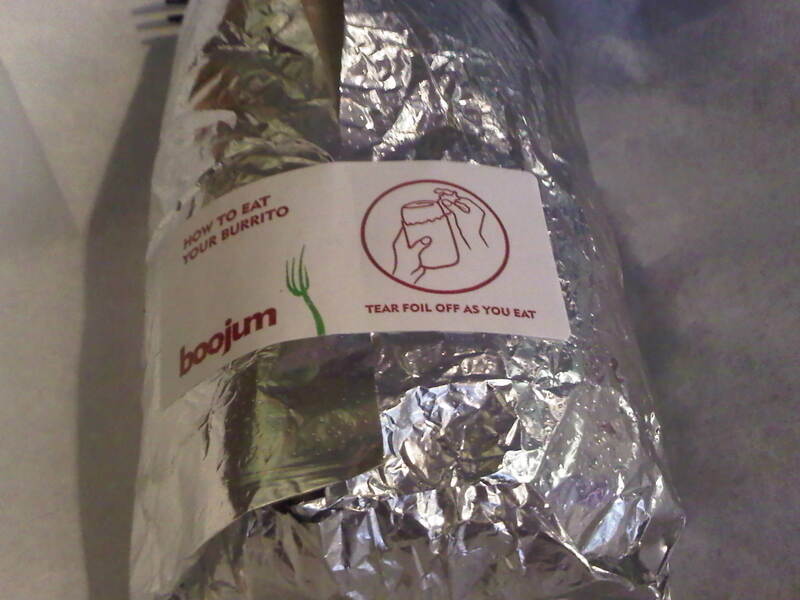 They deserved the opportunity to challenge Boojum, for usurping them from the highest rated burrito that I’ve found. Once again, when I arrived, the restaurant was empty – bar the staff. I was the only customer there, until I’d finished my meal, so they’ll probably know exactly who I am, now! The staff are very friendly, and the manager (at least, I think he was the manager) was playing the flute along with the background music. The burrito that I decided to go for was called the Toluqueno (and I hope that I didn’t embarrass myself trying to pronounce it, as I ordered it!). It consisted of rice, pico de gallo, refried beans, chorizo, Swiss cheese and chilli chipotle. It certainly stood out from the menu as being exactly what I was in the mood for. 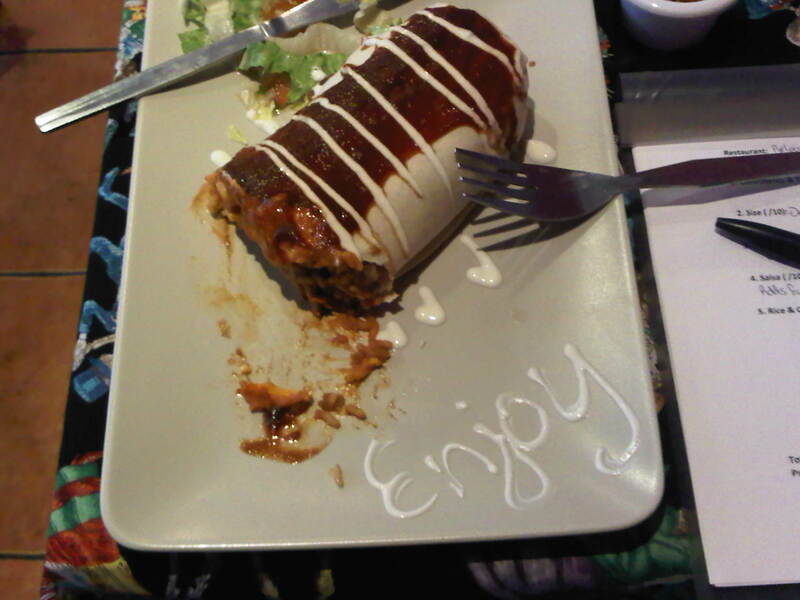 Once again, when I got the burrito, it was presented absolutely beautifully. 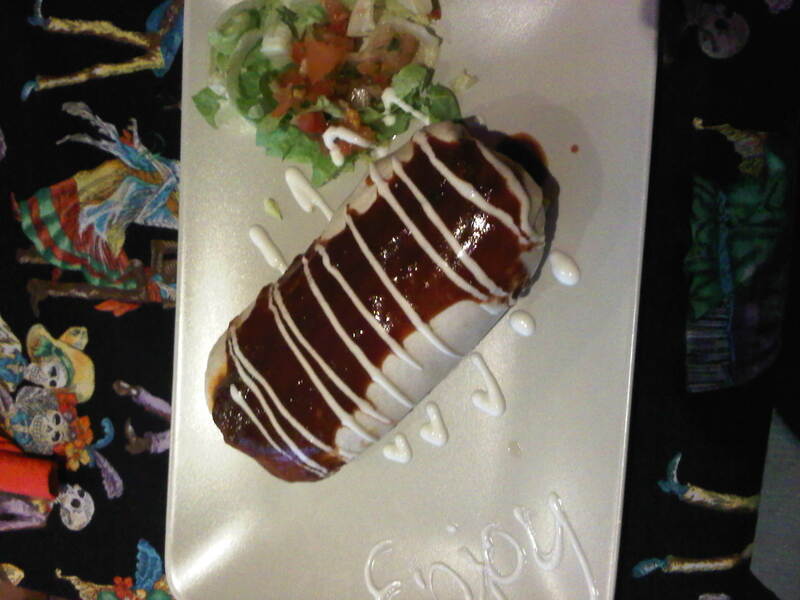 I’ve never seen a burrito restaurant put as much effort into the presentation as Azteca do – it really is stunning. It’s almost a shame to start eating it! I think that there was one very disappointing thing about this burrito: once I’d finished it, I wished that I could have had more. It was seriously enjoyable, and (as the score shows) an incredibly good burrito. Azteca, given the opportunity, have managed to get the one-up on Boojum once again, getting a score of 45/50. So that means that in two weeks, we’ve seen the top rated burrito bar in Dublin change twice – and I’ve only had two burritos in that time. But before I could begin studying, I had one last piece of college work due, and it was due today. As a treat to myself for getting it finished and for being reasonably happy with the quality of the work, I decided to reward myself with a burrito. Well, I was going to go for a burrito today either way, but now I feel like I deserved it. It’s been a very burrito kind of day for me; I woke up this morning craving a trip to Boojum, which is why I trekked there from college for my lunch. 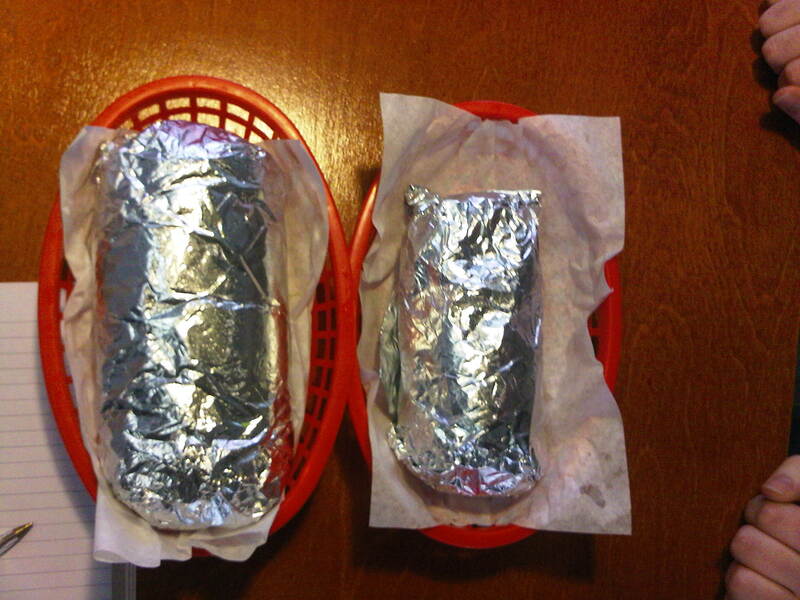 And then my dinner was some more burritos (not nearly as big, seeing as I had three of them!). It’s been a good day. Like I said, I was craving a burrito from Boojum today, after a co-worker of mine ate a Boojum burrito at a board game night in front of us last night. On a side-note: the Game of Thrones board game might possibly be the best game I’ve ever played, and it’s totally worth the extravagant amount of money that it costs (or, it will be, once I get it). So anyway, getting back to my burrito. I spent a few hours studying this morning, so I wanted to get out and stretch my legs anyway, so it really was the perfect day for me to want to go to Boojum. I seemed to get there at the perfect time, too: it wasn’t particularly busy, and I got a seat no problem. And as I left, the queue was out the door, and people were waiting for seats. I always seem to get lucky with my timing at arriving at Boojum. For today’s burrito, I decided to get the Mexican rice, pinto beans and Carnitas (pulled pork) on a white tortilla. I got sour cream, cheese, pico de gallo and guacamole, too. The salsa I went for was the salsa roja, the hottest that Boojum offer. As usual, the staff were ridiculously friendly – like if I smiled like that all day, I’m pretty sure I’d be in pain. They are probably the friendliest staff in any burrito bar in Dublin, and if they’re not, I’ve not been to the burrito bar that does have the friendliest staff. If you’re adding them up in your head as you read this, then you’ll know just how significant a burrito that this was, in my quest to find the best burrito in Dublin. This has managed to beat Café Azteca by a single point, and become the best burrito that I’ve had so far, with a total score of 44/50. And this is a well-deserved score; I very much enjoyed every last bite of it. I honestly didn’t think that anybody would manage to beat Azteca, but I have been proven wrong here. Yesterday was Tiny Donkeys day, and it was the last show of the term. That means that there will be no more Tiny Donkeys until September… *tear* Needless to say, I got a burrito yesterday, as it would be a damn shame to miss out on traditions during the last week of term. You may be wondering why I didn’t write about this particular burrito yesterday, and there are two reasons for that. First, I had a few beers in the radio station (after the burrito), and didn’t want my review to be skewed. The main reason, though, is that I just wasn’t bothered! I was just being lazy in my last week of college. Like the title says, this was a very rushed burrito. The show was meant to start at 6pm, and at 5.55pm I was only ordering my burrito in Tolteca. So I took it to the studio with me, and ate it (and rated it) as we did the show. Needless to say, I did not have much input into the show while I ate. So now that you’ve had a good laugh at my expense, I’ll get to the burrito. I went for the steak in my burrito yesterday, with brown rice, black beans, peppers, cheese, pico de gallo and sour cream. I added guacamole and tortilla chips as extras, and went for the lightning chipotle salsa. The woman who made my burrito thought I was brave, going for their hottest salsa. 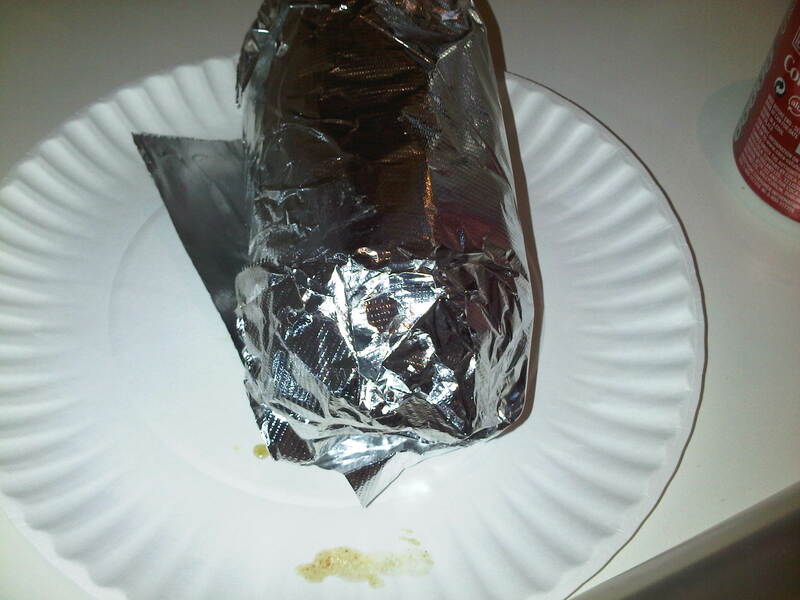 So you’ll see that my rushed burrito fared quite well, as Tolteca always seem to do. A solid score of 38/50 is nothing to be ashamed of! It’s been a while since I ventured away from the burrito bars in the exact vicinity of Trinity, so I decided that today would be a good day to walk up to North Earl Street, and to give Saburritos another go. So when I decided that I was hungry and looking for dinner, that’s what I did. 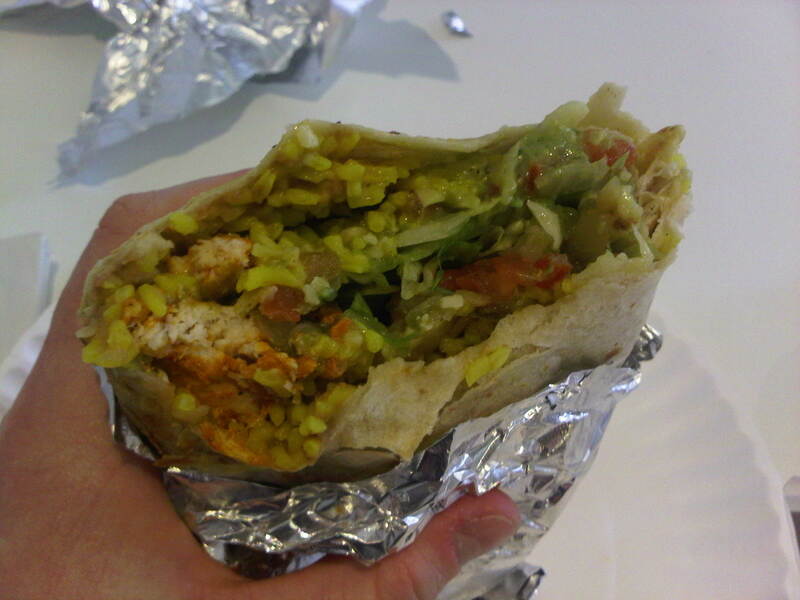 And that made my first decision easier; the meat in today’s burrito was to be chicken. I decided on refried beans and Spanish rice to go with that. I went for the salsa verde (green chilli salsa, which is rated three chillis). I got peppers, cheese and lettuce in my burrito too. I decided that I wanted some extras, so I added guacamole and pico de gallo to my burrito – I was pretty hungry, and they looked tasty. So you’ll see that this burrito, while being grand, was no better than average. It really had so much more potential, when the chicken is taken into account… A score of 34/50 may not be much worse than the last time I was there, but this burrito could have been so much better.